Adheres to any clean surface, including Teflon® fluoropolymer resin-coated materials, and peels off without leaving a sticky residue. Pencil, ball-point pen, or solvent ink marker remain legible under the most demanding laboratory conditions. Consists of colored paper with rubber resin adhesive that resists moisture and most solvents. 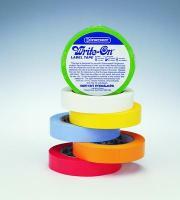 Available in six vivid colors and great for use in low temperature applications. The tape will withstand a maximum temperature of 157°C (315°F) for 30 minutes or 80°C (176°F) for 24 hours. It can be used in temperatures as low as –80°C (–112°F). Tape will withstand a steam autoclaving cycle at 121°C (250°F) and gamma irradiation between 13.0 and 45.0kGy. Ordering Information: Excellent for use with Write-On™ Multi-Roll Label Tape Dispensers (not included). Assorted color pack 134620300 includes one roll each of green, yellow, and white. Assorted color pack 134630600 includes one roll each of blue, green, orange, red, white, and yellow. Cover with Scienceware® Clear Protective Tape for extreme temperature and chemical protection. Tape rolls with 1" dia. core fit Scienceware® dispensers 140334-11 and 140334-10. Tape rolls with 3" dia. core fit Scienceware® dispenser 121080, 140334-11 and 140334-10.